If you think you know all about Australia’s heroes (and villains), think again. In Aussie Aussie Aussie, Ben Pobjie burrows beneath the mythology to provide an intimate look at the Australians who helped make our nation great – as well as the ones who stopped us from being as great as we could have been but who have ended up with their own Wikipedia pages anyway. 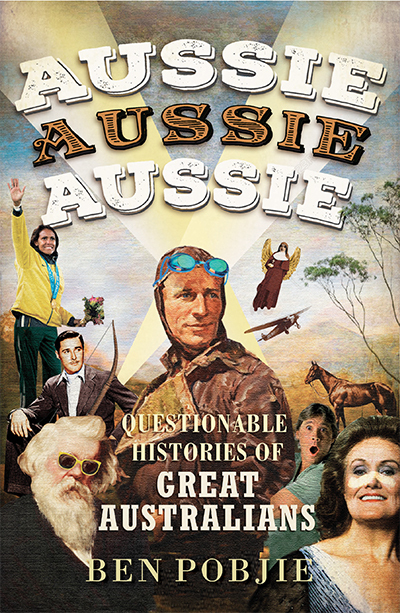 Meet pioneers such as Charles Kingsford Smith, whose groundbreaking efforts moved the country forward; artists and entertainers such as Joan Sutherland, who shaped our national cultural identity; captains of industry such as Rupert Murdoch, who inspired Australia’s love affair with people who amass phenomenal quantities of personal wealth; and humanitarians such as Mary MacKillop, who found fame by dedicating their lives to others and guilt-tripping the rest of us.